At CES 2018, Kia is cornering the market on buzzwords. The Korean automaker announced a host of new initiatives involving self-driving cars, electrified powertrains, connectivity and carsharing. Kia and parent company Hyundai are already experimenting with self-driving cars, but Kia plans to step up those efforts over the next few years. The automaker plans to deploy a “large-scale” test fleet of autonomous cars on public roads in 2019. In 2021, Kia will launch a pilot program for Level 4 autonomous cars in what the company calls “smart cities.” Kia said this will be its first attempt to commercialize self-driving cars, so that will probably be the first opportunity ordinary people get to ride in these robo-Kias. Some of those self-driving cars may feature zero-emission powertrains. Kia says it will offer a total of 16 electrified models by 2025. The automaker’s lineup already includes hybrids, plug-in hybrids, and the all-electric Soul EV, but it will also add a hydrogen fuel-cell vehicle in 2020. Kia will probably lean on parent Hyundai’s fuel-cell expertise for that. Kia used CES to debut the Niro EV concept (pictured above), an all-electric version of a car that is already offered as a hybrid and plug-in hybrid. The Niro EV concept sports a 150-kilowatt (201-horsepower) electric motor, and a claimed 238 miles of range. It also features slightly different styling than the Niro hybrid and plug-in hybrid production variants. Given that it’s based on a model that’s already in production, we wouldn’t be surprised to see the Niro EV make the transition from concept to showroom-ready model. In addition to its all-electric powertrain, the Niro EV concept also features a new human-machine interface. The HMI emphasizes gesture and touch controls, and even allows the driver to control infotainment functions by swiping specified areas of the steering wheel. Kia will also demonstrate in an in-car 5G connection, and an audio system that allows front-seat and rear-seat occupants to hear different sounds. It’s unclear if any of these features will make it to production. Finally, Kia will launch a carsharing service in Europe later this year. Called WiBLE (for “widely accessible”), it’s essentially Kia’s answer to BMW’s ReachNow and Daimler’s Car2Go. Users can reserve a car using a smartphone app, and pay according to how much driving they do. 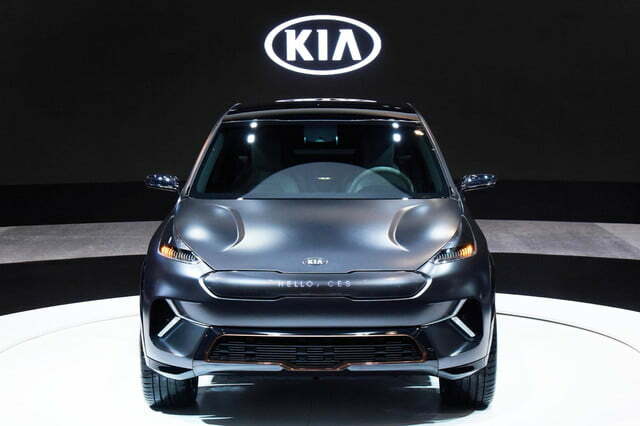 The service may be offered outside of Europe at a future date, Kia said.